The NFL is a fickle thing, you can never rely on any player unless their name is Tom Brady or Luke Keuchly. They seem to be the most consistent offensive and defensive players in the game week in and week out. That's why we play fantasy sports though, it allows us to feel like we can figure out who those big time players are going to be each week. The past few weeks I have been able to get a few hits with guys like Jordan Hicks and Tyrann Mathieu. It's great when my "Best Buys" help you out. DE: When looking at matchup's this week one that sticks out particularly for me is Raiders v. Lions. Neither of these teams have great offensive lines, but Detroit's is far worse. Their line is giving up an average of 2.4 sacks per game, thats good enough for 22nd in the league. That is why I am giving Khalil Mack another chance this week as my DE pick. He bounced back from a goose egg in Week 9 by putting up 8.6 points in Week 10. Costing you only $5400 he should have a field day against Stafford, who is known for making poor decisions and not feeling the pressure in the pocket. I'm giving Mack another shot and so should you because I expect it to pay off in a big way. DT: I am going out on a limb with my next pick, not because the guy is an unknown, but because he signed a 6 year $108 million contract before the season and has not lived up to it at all. No, I am not talking about Ndamukong Suh he actually has played well recently. 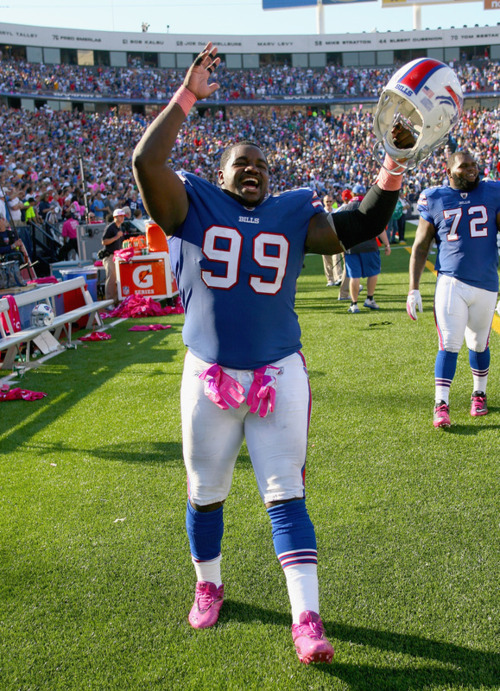 Instead, I am talking about a guy from Buffalo named Marcell Dareus. He has only averaged 4.2 fppg and has been a huge letdown defensively for the Bills. That changes this week when they take on the Patriots Monday night. Rex Ryan will have his defense fired up to take on the undefeated Pats, but they will need Dareus to improve on his last matchup against Brady and Belichick when he registered only 1 point. The defense will never meet it's full potential without their $100 million dollar man not making an impact and the pieced together Pats line should give him the opportunity to finally show what Buffalo is paying him to do. LB: A rivalry game that doesn't hold the same intensity it has over the past few years is taking place this weekend in Seattle. The 49ers and Seahawks squaring off in Week 11 in the past meant division titles being decided. This year all it means is two teams trying to reach .500 or get closer to a respectable record. The positive for San Francisco is the 49ers have seem to find a bright spot in their young LB Aaron Lynch, who has averaged 7.5 fppg so far this year. He is my "Best Buy" this week though because he will cost you only $5300 and in his last matchup against Seattle he put up an impressive 14.1 points. I expect a similar outcome do to the fact that Lynch seems to have big games against QB's who are a little more mobile (Sea, GB, Min). He put 11 points or more in all three of those matchup's and believe he will continue that streak. CB: Once in a while a cornerback makes a play that springs him into a new level of player. It shows the rest of the league and QB's that they may want to look in the other direction when dropping back to pass. Well Malcolm Butler took a step towards that level last year in the Super Bowl when making the game winning interception against Russell Wilson. Too soon Seahawks fans? Anyway Butler took another step this past weekend when he knocked what would have likely been the game winning TD pass from OBJ's hands. Butler is starting to show that he is becoming one of the better cornerbacks in the league and has proven he can matchup with the top WR's. Sure he is no Darrelle Revis or Richard Sherman, and probably never will be, but if he can keep a teams No.1 reciever covered up and allow small plays he should do well and when he costs $5300 while averaging 5.9 fppg I am willing to take a chance on him. S: Last and not least I am suggesting everyone get Malcolm Jenkins this week going up against Jameis Winston at home in Philadelphia. Jenkins has been all over the field this year and is averaging 8.8 fppg, while posting no less than 7 points in 8 out of the Eagles 9 games. Jenkins will set you back only $6300 and gives you top four position talent. He is a steal this week and should really create a "No Fly Zone" above Lincoln Financial Field on Sunday.